February 2012 | The Misadventures of Roni G! Long before the infamous Damaso stunt, me and my friends have always wanted to try and experience Carlos Celdran's walking tour of Intramuros. My sisters joined the tour a couple of months back and had good reviews, much like as advertised on TV or in blogs. I finally got the chance to walk the way of The Pied Piper of Manila last Sunday. 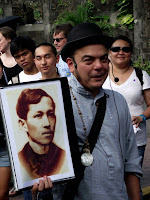 I've been to Fort Santiago a couple of times, latest was just march last year. I was surprised at the number of tourists, foreigners and locals alike, but was surprised most when more or less a hundred of them was also joining the Walk This Way tour. I was really expecting a small group, around 20-30 just like what I saw on TV. It's even more surprising that there are a lot of locals who were willing to shell out a steep Php1,100 for the tour. The "show" began at the entrance gate of Fort Santiago with the Philippine National Anthem. With a small Philippine flag in the Pied Piper's hand, locals started to sing with their hands on their chest. This, I believe is a really nice touch to the tour.